Microsoft has announced the details of a new bundle that will be included as a part of the Kinect launch. This new bundle will be a step up from the previously announced Xbox 360 S 4GB and Kinect bundle which went on sale in August. 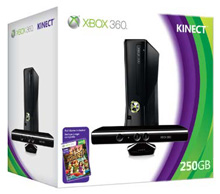 Microsoft will be throwing in the Xbox 360 S 250GB plus the Kinect accessory itself, and the game 'Kinect Adventures'. This bundle will set you back a cool four hundred dollars if you decide to pounce on it November 4th (The North American release date for Kinect). Kinect will go on sale on November 10th in Europe, followed by November 20th in Japan. It's sitting pretty now, but it won't hesitate to take a bite out of your wallet. Analysts have criticized Kinect's lack of worldwide language support. The new motion based gaming accessory from Microsoft will only have support for English, Japanese, and Mexican Spanish upon launch. Despite it's limitations, representatives from Microsoft predict that the accessory alone will sell four million consoles this holiday season. Got the Xbox kinect a few days ago, thought it was totally awesome! Better than a Wii, I suppose the only complaint is you do need a lot of space to play it, a very large living room. I recived the Xbox Kinect for Christmas. It's amazing! No controller needed or anything. I reconmend everyone buying one!